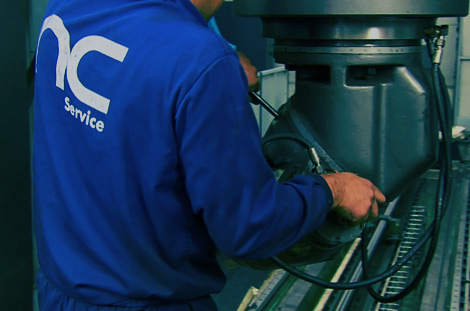 At NC SERVICE we are committed to ever improving the service offered to our machine-tool customers. Therefore, one of our aims is to offer a TECHNICAL SUPPORT SERVICE with a guaranteed high speed response and the highest quality, thereby minimising customer downtimes and any costs incurred by technical problems in their machines. With this aim in mind, NC SERVICE has a team of highly-skilled professionals, with extensive training and experience in providing support for industrial machines, being able to fully meet the needs of even our most demanding customers. Work is performed using the very latest equipment, tools and auxiliary devices required for levelling, geometric verifications, laser, ballbar, etc., providing the appropriate certificates. NC SERVICE offers its customers excellent quality and accuracy in the execution of the work required to move your machines, either due to an extension, relocation of business, or the purchase of new machines, amongst others. The work performed by NC SERVICE commences with an inspection of the machine condition, preparing a report for the customer indicating the initial situation of the machine geometry prior to disassembly. Subsequently, all the structural elements are disassembled, fully identified and tagged and packed, to facilitate transport and subsequent assembly. Finally, at the definitive location, all the machine parts are assembled, the machine is installed and started-up, during which another calibration is made and a further check to ensure correct operation, guaranteeing that the machine is operating with at least the same conditions with regard to alignment and geometry as prior to the transfer, and even improving these conditions given the fact that, during the process, our experienced engineers are capable of correcting certain accuracy errors. Finally, the appropriate tests are conducted for the satisfactory acceptance of the machine by our customer. At NC SERVICE we firmly believe in the philosophy that the correct installation and commissioning of a machine is a decisive factor when optimising future performance and output, principally with regard to accuracy. Also, together with our customers, we always check that the machine is operating correctly. Our work is only considered to be completed once we have guaranteed full customer satisfaction and the perfect performance of the machine, based on the accuracy required for the work to be performed. At NC SERVICE, thanks to our team of highly-skilled professionals and our high-tech equipment and resources, we are able to offer our customers a TECHNICAL SUPPORT SERVICE that is able to minimise the costs incurred by potential technical problems in your machines. Our long-standing experience allows us to diagnose, analyse and solve situations, minimising downtime and the cost for our customers. In recognition of this excellent technical support service and our long-standing experience, the manufacturer CORREA appointed NC SERVICE as the OFFICIAL TECHNICAL SUPPORT SERVICE for its milling machines in Northern Spain (Basque Country, Navarre, Cantabria and Aragon). Our engineers at NC SERVICE are ready to pass on their extensive knowledge in the operation of machines and numerical control, by giving training courses to our customers. Primarily, when installing and commissioning your machine, our customers demand a series of instructions and knowledge required to allow them to operate the machine correctly, and greater optimisation and accuracy when performing specific work required by each customer. At NC SERVICE we're able to pass on the knowledge required to enable our customers to be fully conversant with the operation of the machine, primarily with regard to the functioning of the numerical control. Within the numerical control sector, we are specialists in the HEIDENHAIN brand. For NC SERVICE, the compliance of its machines with the standards and regulations in force is one more step in the second-hand milling machine retrofitting process. At present, the increasingly demanding standards and regulations have established that the occasion machinery purchasers are also responsible for ensuring that these machines are compliant with the legislation in force. Due to the excellent quality of our service and our ongoing commitment to customer satisfaction, the occasion milling machines offered by NC SERVICE are unique on the market, as far as this commitment is concerned. Do you need technical support for your machine?